Instantly transform your home from "everyday" into "party time" with this fun, festive and colorful set of party decorating essentials. Start with an extra large 33" x 65" Birthday Banner. Complete the setting with a Confetti Bash plastic tablecloth, 3 types of Birthday confetti, and 6 sets of Confetti Bash Birthday swirl hanging decorations. 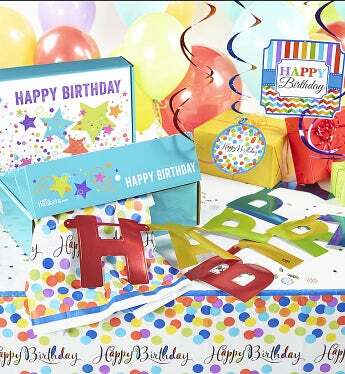 Extra Large Plastic Rainbow Colored Happy Birthday Banner, 33.5" x 65"
Confetti Bash Plastic Tablecloth, 54" x 102"